Bokken is a training sword, used as a relatively safe and inexpensive substitute for a real blade in several martial arts. Then the veteran iaidoka will use a bokken for safety reasons. 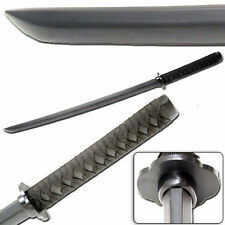 This 40" daito is an ideal practice sword to safely practice your sword skills while protecting your self and partners. Kendo Bamboo Shinai Training / Practice Sword Straight from the scenes of Japan or Singapore, this martial arts weapon is opening eyes everywhere. This 47"overall bamboo Shinai sword is designed for use as either a practice sword or a lightweight fighting tool. The Bokken Is Constructed Of Hardwood With A Red Burgundy Lacquer Finish. The Handle Of The Bokken Is Wrapped In A Cord, Just As A Katana Would Be. Martial Arts. Martial Arts Training Sword. Exercise & Fitness. Hunting Knives. Hardwood Construction. Knife Sharpeners & Accessories. For Training & Practice. Scopes & Optics. This is a Wooden Practice Tai Chi Sword that is perfect for all skill levels. Also, a great tool for trainees. This is great for practice. It is also crafted of finished walnut wood (sanded and lacquered) for long lasting use. The most unique part of this set is their engraved Dragons which wrap themselves around these wooden bokken blades. There are both constructed of oak with a solid black lacquer finish. The handles are wrapped with a black cotton cord, just like an actual katana. These Practice Training Boken Daito Swords are Made up of Polypropylene Material. New Kind/Material. They are Remarkably stiff, but not quite as rigid as wood. They do have a bit of play to them. All Black. 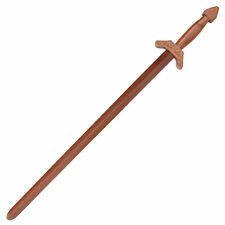 Available here is a wooden practice sword made of one solid piece of white oak. This sword is very strong, well-balanced, and can take a lot of abuse. This is sure to suit all of your martial arts or other sword-training needs! 40" long wooden bokken. Made of durable hardwood. Great for practice. 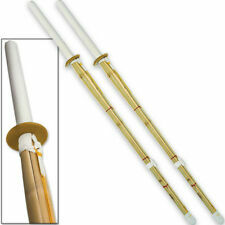 This is a 44" long premium quality bamboo shinai. The shinai is used for training in Kendo or a lightweight fighting tool. The shinai is constructed of thick sheaves of bamboo tied together. The handle of the shinai is sued. Khopesh Training Sword. Always wear protection when training with a Kalaj Kutter. "I designed this division of the Kalaj Kutter line to assist the student in gaining the. usefulness of the unit were my main concerns when I was in the developing process. The bokken is typically used as a training tool for learning Kendo, Iaido or Kenjutsu training. The greatest proponent of the bokken would be Musashi. For the majority of the duels Musashi used only a bokken. Martial Arts. Martial Arts Training Sword. Exercise & Fitness. Hunting Knives. Knife Sharpeners & Accessories. For Training & Practice. 42" Overall. Airsoft Shotguns. 40" long wooden bokken with wooden sheath. 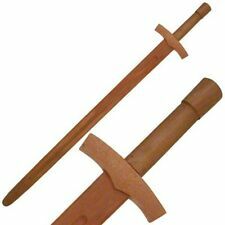 Beautifully crafted hardwood sword with a hardwood scabbard and affixed hardwood hand guard. Patent Pending. Perfect for sword drawing practice. Set of 2 Black Padded Sparring Bokken Foam Sword Practice Blade. The core is constructed with ABS plastic with foam covering. 26" Foam Grip. These policies are used as guidelines. ABS Plastic Core. Set of 2 Swords . How Real Sword Master Works. It is your responsibility to check the item for any possible defects before using this item. No signs of being used, and or scratches. This is a 39" Black Polypropylene Kendo Bokken Bokuto Practice Training Samurai Sword Katana with SCABBARD.The Bokken is a practice weapon for the Japanese sword arts. This weapon was used primarily for sparring and kata training. It is your responsibility to check the item for any possible defects before using this item. No signs of being used, and or scratches. New products and markdowns arriving weekly! 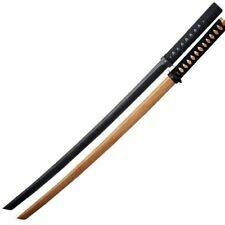 This is a 29" Black Wooden Samurai Katana Sword. The sword is perfect as a prop, for plays, or just for fun. How Real Sword Master Works. It is your responsibility to check the item for any possible defects before using this item. This bokken is a great way to practice without doing harm to yourself or your opponent. Bokkens have simple wooden construction demands less care and maintenance than a katana. This form of practice is intended primarily for kendo practitioners up to Nidan ranking, but can be beneficial for all kendo students. 46" Shinai. Kendo Bamboo Sword. Axe & Hatchet. Sling Shot. Samurai Wooden Training Sword. Fixed Blade Knives. Select "Just didnt like it". We are the leading supplier of knives, swords, stun guns, airsoft and pepper spray. Full size Katana Nylon Carrying Case. Stitched onto the nylon case are two separate adjustable should strap which goes onto your back. Either you hold it on your shoulder or strap it onto your back. The Boken is a practice weapon for the Japanese sword arts and it was used primarily for Kata form training. However, a boken itself is quite an effective weapon on it own. It was constructed with a high detail to replicate the look and feel of a Katana.In the hands of an experienced kendo master a boken can be just as exact and devastating as an actual sword. Blade Length: 16.06&quote;. Steel: 3Cr13 powder coated stainless steel. Handle Length: 6.56&quote;. Handle Material: TPE. Solid Japanese Suburito Practice Sword -- Wooden Training Katana/Bokken 22"
The bokken is constructed from wood with a Red glossy finish. A cotton wrap has been wrapped over the handle of the sword. The Bokken is Katana length. A plastic guard and securing ring are included with the bokken. The guard is black and the blade is black. This sword also has a black blade collar which is located above the guard. This sword is perfect for sword playing or sparring. The black makes this sword look stealth and deadly. This is a 40" premium quality hardwood bokken. The bokken is typically used as a training tool for learning Kendo, Iaido or Kenjutsu training. The bokken is typically used for practice of Kendo, but do not let that fool you into thinking the bokken is harmless. Beautiful in design. The ancient Chinese used the Butterfly swords as a double short length sword with a unique handle to catch the longer swords in between it's handle. Made of light steel for demonstrations and competition. Wooden Suburito Samurai Sword Training Bokken Kendo Kantana Practice Boken 45.5"
Samurai practice sword. Red Oak Hardwood construction. COLDSTEEL 92BKHNH. MPN 92BKHNH. Hand-and-a-Half Polypropylene Training Sword 34&quote; Blade. Material: Polypropylene. Blade Length: 34&quote;. Overall Length: 44&quote;. New ListingPurpleheart bokuto, bokken and wakizashi bo set. Handmade exotic hardwood. Purpleheart bokuto - bokken and wakizashi bo matching set.. Tachi is 40 1/8 inches in length with 12 inch handle, weight approximately 1 pound 11 ounces. Kodachi is 25 5/8 inches with 7 1/2 inch handle, weight 532 grams (approximately 1 pound 3 ounces). Vertically laminated, finished with an oil and varnish mix. Pieces are very straight with a subtle blade curvature. Suitable for paired practice. Hand made one of a kind pieces, for what it's worth.  Close examination of the top of the wakizashi bo reveals a thin crack in the grain appearing as a small dark line. Please feel free to contact me with any questions. Thanks for looking! Here is a 38" wood practice Sword. The bokken is constructed of oak with a solid black lacquer finish. The handle of the bokken is wrapped with a black cotton cord, just as a katana would be. The guard is black it is made with ABS material and includes a rubber securing ring. The Bokken is a practice weapon for the Japanese sword arts. This weapon was used primarily for sparring and kata training. However, a bokken itself is quite an effective weapon on its own. In the hands of an experienced kendo master a bokken can be just as exact and devastating as an actual sword. The bokken is constructed of hardwood with a black lacquer finish. The handle of the bokken is wrapped in a cord, just as a katana would be. Great for practicing drawing technique, this white oak bokken has been smoothed, sanded and lightly glossed for a remarkable finish. The scabbard is made from 100% white oak and like the blade, it has been polished and sanded to a smooth and glossy finish. Samurai Style Fighting Sword. Wood Practice Sword. Overall Length 40". We will promptly reply within 24 hours. Spar and train with an experience opponent to hone your skills. This bokken is all-natural wood with black lacquer finish. Included is an ABS guard with securing ring. One side of the blade is blank and the other side has the Foo-Dog with the Flower engraved. LOT OF 3 (THREE) VINTAGE SWORDS! FILIPINO BOLOS BUNDLE DEAL! Condition is Used. These will make a great addition to anyones collection. For your projects, builds, display or for FMA live blade training, these are sweeeet! I was going to list them individually, but my loss your gain! Purpleheart bokuto, bokken and wakizashi bo set. Handmade exotic hardwood.